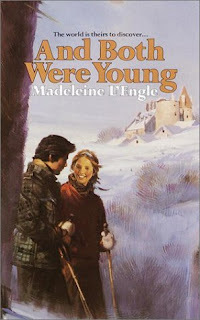 I think this may have been the last Madeleine L'Engle book I read (for the first time) as a teenager. And for some reason it holds a sort of distinction in my head because of that fact. I, like most other readers I know who love her books, got in on the whole thing with A Wrinkle in Time , moving on to the other Murry and O'Keefe family books and then the Austin family series and so on from there. I must have been somewhere around ten or so when I first read the Time series and by the time I got through all the others and worked my way around to her standalones I was a bit older. Although one of my very favorite things about her body of young adult work is that there are so many connections between them. And while And Both Were Young is probably one of the most standalone of them all, for the discerning reader there is a very lovely, very oblique reference to its main character in L'Engle's much later novel A Severed Wasp . Interestingly, I don't think I ever realized just how old this book is. Originally published in 1949, it was actually her first young adult novel. Incidentally, my copy features the cover on the left. I chose this book for today's edition of Retro Friday because the lovely new edition on the right was just released on Tuesday and, as it is one of my very favorite of L'Engle's books, I wanted to highlight it here while I convince my local bookshop to order a copy into the store. Flip is the kind of foot-in-her-mouth, arms-and-legs-everywhere protagonist that I connected with instantly as a teen reader. I loved her for her haplessness and the way that she just kept on stumbling through her outer coating of awkward to a place where she could voice her thoughts and experiences so that someone else could see them and appreciate her for who she was. In my eyes, that made her admirable--that drive to keep going despite the many misconceptions and deliberate slights of those around her. That was what was so hard for me at that age, and I like to think I drew a little strength from watching her try and fail and try again and succeed. It helped that her interactions with Percy were so poignant, particularly in the wake of having lost her mother and being without her father. The other girls at the school were especially well done as well. At first you think they will be mere stereotypical characterizations, the way Flip almost expects them to be, but they each emerge from their initial roles to play an important part in Flip's development. And then there's Paul. Lovely Paul. He has long reminded me of Jeff Greene from A Solitary Blue and a kinder, less destructive Zachary Grey. Yes. You will fall in love with Paul just as much as Flip does. And the even more gratifying thing is that the story is not just about Flip's journey to self-discovery, but Paul's as well. It's not all the way he fills her needs, but how she fills his as he has an unusually dark past that he is rather successfully steadfastly refusing to deal with until Flip comes along. This is an eternally sweet and moving book. Like so many of L'Engle's books, I turn to this one when I want to be reminded that the world and the people in it can be beautiful despite the darkness. L'Engle played such a big part in my childhood and pre-teen years, I can't believe I haven't heard of this one before! The storyline reminds me faintly (mostly the foreign boarding school aspect) of Bloomability by Sharon Creech, which I also loved. I have a friend who's been recommending this to me forever but for some reason I never seem to get around to it. I don't know why, because it sounds like exactly the sort of thing I'd like -- when I was a teenager I loved the idea of Swiss boarding school! This is the L'Engle I've read over and over thru the years, rather than her sci fi. This one I connected with as a teenager - I think most girls would connect with Flip - and I still have a great fondness as an adult. And the connections to WWII still mean something today. It's a very good book. And very sweet. Jill, that makes me happy to hear. And I agree, it's worn very well over the years and holds so much meaning despite its age. I loved L'Engle's Time series when I was younger but I've never heard of this one before. I'm definitely going to check it out if/when it gets here. Is Camilla just as good? Chachic, CAMILLA is very unique among L'Engle's work. Definitely worth a read. And she continues Camilla and her family's story in the much later A LIVE COAL IN THE SEA, which is just wonderful. I like your blog! I've added a link to it from my blog, on a new Book Review Blogs page. I'll soon be blogging about the importance of reviewers. Suzette, thanks for the add and your kind comment. I'll be sure to check out your new page. Oh, I love this one, too. And I turn to L'Engle's books over and over again, for exactly the reason you mention. It's great that you're spreading the word about this one! Darla, it deserves spreading, doesn't it? I devoured everything I could find by her way back when. But I know several get lost in the cracks for many. I also first read And Both Were Young as a teenager. I reread some of it this morning, looking for a vaguely-remembered line, and felt so nostalgic for my first few years of independent reading!